Has it already been 40 years? While not its original location (that was on the old Pack Square), Pack Memorial Library is celebrating its 40th anniversary on Haywood Street. 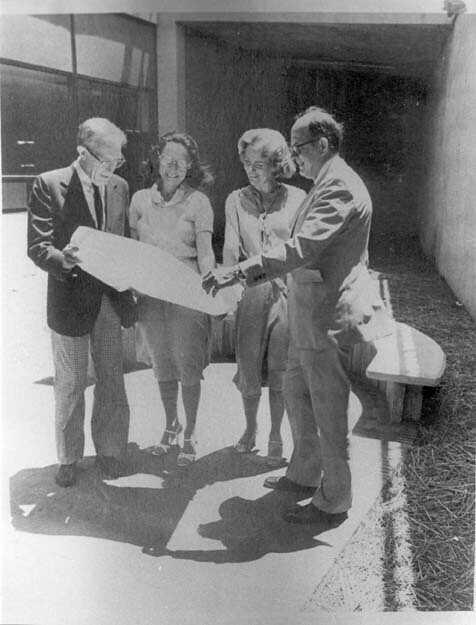 The building was officially dedicated on Nov. 18, 1978. The first Pack Memorial Library was built in 1911 for its namesake George Willis Pack. Buncombe County reached out to former Pack Memorial Library Director Ed Sheary to ask about his time in both buildings. What is your history working with Pack Memorial Library? I started work at Pack Library as a book shelver in the reference department in 1968. I was 15, and this was nothing more than an after-school job. I needed a job, and this one paid a whopping 90-cents per hour. I quit for a while, but then was rehired a few months later as the part-time Assistant to Community Activities Librarian John Bridges. I worked for John through high school and then college at UNC-Asheville until I left for graduate school in 1975. Why was there a need for a new library building? The 1925 vintage library on the square was a beautiful building, but it was overcrowded, could not be expanded due to surrounding buildings, and even in the 70s there was a parking problem in downtown Asheville. The library board, led by architect Anthony Lord, had been looking at relocation options from the late 1940s. In the 70s, the library looked seriously at moving to the Pearlman's Building on Haywood and the Sears Building on Coxe Avenue. The Civic Center project on Haywood presented an opportunity to build a new building on the site of Harry's Cadillac and to share the garage being built for the Civic Center. At this time, the library was a City agency. What was the community’s response to the new Pack Memorial Library? It was very positive. I was working in the library in Concord, NC when the new Pack Library opened in 1978, but I came home for the dedication and opening. How have you seen downtown Asheville and Pack Memorial Library change over the decades? I returned to Pack as Director in 1990, and it was a very different place than the one I left in 1975. Downtown had been saved from near destruction by developers in the 1980s, and I was back in time to see the post-Asheville mall renaissance of downtown begin in earnest. The library anchored Haywood Street, people started living in downtown itself, Montford became the hot place to live, and Pack evolved from being the central reference library for the County to becoming much more of a downtown, community library. The internet changed the book business, and Pack became the primary provider of public internet for people who didn't have it at home. What it’s like working in a library in thriving (and sometimes not so thriving) downtown area? Part library work, part social work. What have you seen change the most library services over the years? The internet displaced some of the traditional library reference service, and the staff responded by becoming guides in how to use the internet effectively. Interestingly, circulation of print books has held remarkably steady through this revolution. Children’s services became increasingly important as a driver of library use. What’s your all-time favorite book? Catch-22 is my touchstone book. I read it every few years while I was working in local government. It explains everything. What’s your favorite spot in the library? The lounge area on the Vanderbilt side with the view of the Grove Park Inn. What’s your favorite memory of Pack Memorial Library? The staff lounge in the old library on the square. The center of gossip, the place where rank did not apply, and the Cokes were a nickel. What do you see as the future of libraries as community resources? As you say, community resource, that is pretty much it. Public libraries are just about the last public space in America. It is open in every sense of the word.